Monitor low CO levels and display the current peak CO levels detected as low as 10 PPM. 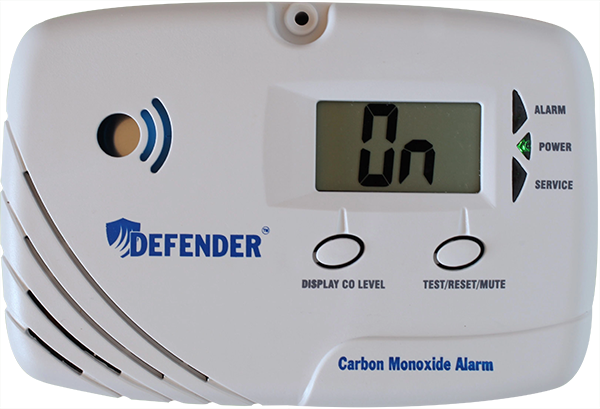 You with this carbon monoxide detector you can view the duration of the peak level all with the touch of a button. The Defender CA6150 Sealed Lithium Battery Powered carbon monoxide alarm enables the home owner to monitor the current and peak CO levels from 10 PPM. The non-removable lifetime batteries never have to be replaced, cannot be pilfered for us in another device, and are warranted to power the detector for ten years. Secure mounting system protects detector installation. The Environmental Protection Agency warns that exposure to low levels of CO can cause long-term health damage, even after the CO source is removed. Those at high risk include the elderly, pregnant women, young children and persons with medical conditions. Low CO levels are defined as below 30 ppm. The risks associated with CO exposure increase with time. With one touch of a button, the Defender CA6150 enables you to monitor the current CO level detected as low as 10 ppm, the highest CO level detected from 10-999 ppm, and for how long the peak CO level was detected.